What does a food server do? Would you make a good food server? Take our career test to find out how you match with this and over 800 other careers. What is the workplace of a Food Server like? A food server is someone who performs a variety of customer service, food preparation, and cleaning duties in full-service restaurants, casual dining eateries, and other eating and drinking places. They are employed in restaurants, schools, hospitals, cafeterias, and other dining places. The majority work part time, which often includes early mornings, late evenings, weekends, and holidays. 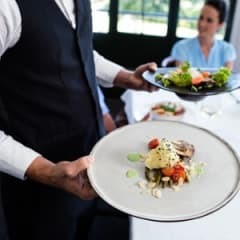 Food servers are the front line of customer service in full-service restaurants, casual dining eateries, and other food service establishments. Depending on the establishment, they might take customers’ food and drink orders and prepare and serve food and beverages. Most work as part of a team, helping coworkers to improve workflow and customer service. Some food servers are referred to as counter attendants because they mainly take orders and serve food over a counter in snack bars, cafeterias, movie theatres, and coffee shops. They fill cups with coffee, soda, and other beverages, and may prepare fountain specialties, such as milkshakes and ice cream sundaes. They may take carryout orders from diners and wrap or place items in containers. They clean counters, write itemized bills, and sometimes accept payment. Some act as carhops, bringing orders to parked cars. Are you suited to be a food server? Food servers have distinct personalities. They tend to be social individuals, which means they’re kind, generous, cooperative, patient, caring, helpful, empathetic, tactful, and friendly. They excel at socializing, helping others, and teaching. Some of them are also enterprising, meaning they’re adventurous, ambitious, assertive, extroverted, energetic, enthusiastic, confident, and optimistic. Does this sound like you? Take our free career test to find out if becoming a food server is right for you. Food servers work in full-service restaurants, casual dining eateries, coffee shops, and other eating and drinking establishments.